Alabama has a long and unfortunate record on civil and voting rights. It was the epicenter of some of the most vicious racism in the history of our nation (ex. Birmingham was nicknamed “Bombingham” after a series of anti-black bombings on churches and businesses) and was one of the front lines for desegregation activism (ex. the Selma-Montgomery March). While most Americans believe this terrible chapter in Alabama history to over with and irrelevant to the modern era, a shadow of this racist past has been cast over the state by the recent actions of state legislators. Last week, it was announced that Alabama would cut $11 million from the state Department of Motor Vehicles budget, forcing it to close 31 DMV offices across the state. 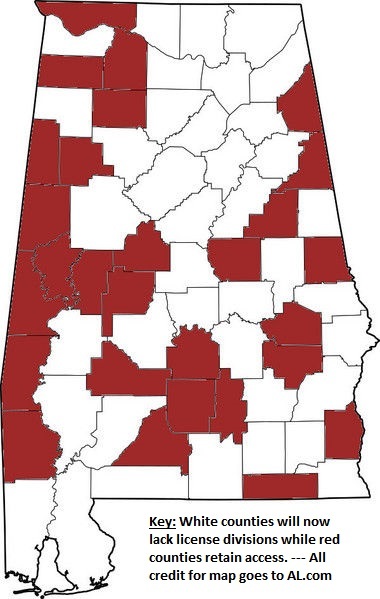 Because of these closures 28 Alabama counties will lack a DMV and residents will have to travel a significant distance to receive any service. Included in the counties that will lose service are eight of the ten counties—Bullock, Greene, Hale, Lowndes, Macon, Perry, Sumter and Wilcox—with the highest African American populations (as a percentage of the total population) in the state. By the end of the year, it is anticipated that only 4 DMVs will be open in the state, and none of these offices will be in counties where 75% of the population is African American. These remaining DMV offices will be absolutely flooded with new applicants and wait times will dramatically increase. These wait times increases will be particularly harmful to low-income workers (who cannot afford to take time off) and the elderly (who cannot comfortably wait in the DMV). The discriminatory nature of the DMV closures will make it far harder for many African American residents across the state to obtain a driver’s license or state identification card. By those documents’ very nature, people who seek them are unable to rely on personal vehicles (you can’t drive your car to apply for a driver’s license) and there are few public transportation opportunities for those living in these areas. In many cases, residents in these areas will be forced to rely on family/friends, or try to save up enough to pay for extremely expensive taxi rides to and from the DMV. This situation would be outrageous even if this discriminatory lack of access to official documents were where it ended—unfortunately, this situation is actually far worse, as Alabama has a voter identification law that will prevent people without state-issued photo identification from voting. In totality, the Alabama government has just made it extremely difficult for thousands of African American citizens of their state to access the documents that are necessary to vote. While many white citizens will also be affected by this (primary poor whites living in rural areas), the targeting of these cuts on African American population centers is clear and will produce intensely discriminatory results. Put simply, there is no good way to look at this situation. At best, Alabama politicians have decided to cut the budget by eviscerating access to vital public services for the most vulnerable and least represented citizens of their state. If this is the case, race never came into the calculations and these officials simply decided to pick on the people who lack the resources to protest their actions and the access to seek redress at the voting booths (cutting services in rich areas would anger a lot of “people who matter” while doing the same in a poor neighborhood is unlikely to harm people who have the social capital to really create a fuss). This makes these officials immoral, classist and short-sighted, albeit not racists. At worst, the Alabama GOP is using budget cuts as a weapon to enact a massive disenfranchisement campaign against African Americans in their state. They are skirting federal court rulings and civil rights laws by essentially restoring poll taxes to their state through a thinly-veiled policy veneer. Because it is illegal to block access to the polls by race, these officials decided to target minorities based upon the segregated geography of the state (enforced through decades of red-lining, systemic racism, and white flight). Honestly, I see no purpose in parsing the internal justifications of the Alabama officials who made this decision. Regardless of whether those making it are racists or simply opportunists seeking to save money on the backs of the poor, the real-life effects of their actions are negative, racially discriminatory, and completely unacceptable. The federal government must step in and stop these closures, if only to protect the voting rights of those who would be affected. Additionally, I would argue that this is a clear attempt to disenfranchise African American residents of the state of Alabama and that Section 5 of the Voting Rights Act should be applied to the state, forcing them to pre-clear decisions that may affect voting with the DOJ before they are implemented (and, with their decision to pass a voter ID law, this should include access to state identification). Some politicians and activists have started to take action on this issue. Alabama Congresswoman Terri Sewell has sent an official letter to the Department of Justice requesting a federal civil rights investigation into these closures and MoveOn.org is hosting a petition to raise awareness/call for action which has over 100,000 signatures. These efforts should be supported and anybody who has an opportunity to protest these closures should make their opinions known. Finally, this unfortunate situation may actually be an opportunity for pro-voting advocates. 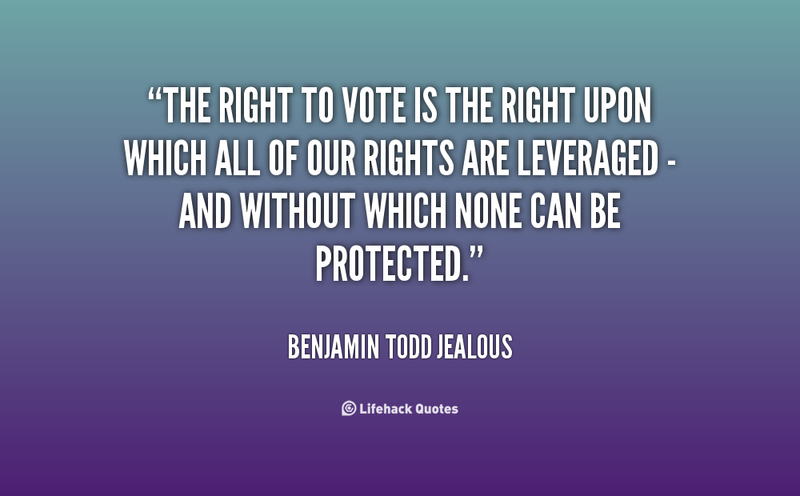 It is human nature to rebel against attempts to restrict your rights, and the idea that somebody wants to deny you the right to vote is an excellent motivator to get out and vote. Pro-voting activists should incorporate these closures into their messaging and frame this attack on voting as a prelude to more to come—basically, they should make it clear to African American, rural, poor, and elderly voters that 2016 is a vital year to reach the polls, as it may become much harder to vote in the future if the wrong people get elected. If you live in Alabama and want to obtain a license or voter ID card before the next round of closures, you can follow this link to find the nearest Driver’s License Office (with hours and contact info). It was Alabama that sued to overturn the Voters Right Act. Now they are proving why it was so critical. These people are relentless. So much hate. There is something wrong with the graphic and the caption for it. I believe the caption should read that the red counties will NOT have a DMV location, not the White counties. Why? Because there is no way the white citizens living in the most populated counties would stand for there not being multiple DMV locations accessible to them. Your graphic caption has the message backwards. Look at Jefferson and Shelby counties, for example.